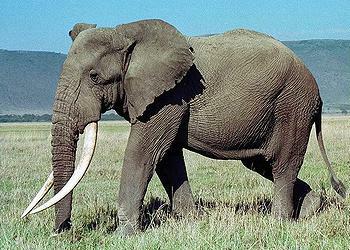 LONDON, UK, November 6, 2014 (ENS) – Chinese-led criminal syndicates are conspiring with corrupt Tanzanian officials to traffic huge amounts of ivory, a trade that has caused half of Tanzania’s elephants to be poached in the past five years, alleges a new study released today by the nonprofit Environmental Investigation Agency. In December 2013, an official visit by a Chinese naval task force to Tanzania’s capital city port of Dar es Salaam spurred a major surge in business for ivory traders, with one dealer boasting of making US$50,000 from sales to naval personnel, the report states. A Chinese national was caught trying to enter the port with 81 illegal tusks intended for two mid-ranking Chinese naval officers, the report alleges. As early as 2006, EIA undercover investigators were told by ivory suppliers in the Mwenge district of Dar es Salaam, that some Chinese Embassy staff were major buyers of their ivory. “An official of Tanzania’s wildlife department even offered to sell the EIA’s investigators tusks from the government’s ivory storeroom and to put them in touch with a dealer who could provide ivory from Tanzania’s world famous Selous Reserve. The report, “Vanishing Point – Criminality, Corruption and the Devastation of Tanzania’s Elephants,” documents the steep 67 percent drop in the elephant population in the Selous Reserve. The 38,975 elephants that populated the Selous Reserve four years ago have been reduced to just 13,084 today. 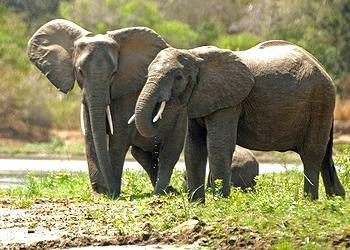 Tanzania has lost more elephants to poaching during this four-year period than any other country – 10,000 in 2013 alone, equivalent to 30 a day, the report shows. “Vanishing Point” reveals how some politicians from Tanzania’s ruling Chama Cha Mapinduzi (CCM) party and well-connected business people use their influence to protect ivory traffickers. In 2013, former Natural Resources and Tourism Minister Khamis Kagasheki named four CCM MPs as involved in elephant poaching. “This business involves rich people and politicians who have formed a very sophisticated network,” said Kagasheki at the time. A year earlier, a secret list of the main culprits behind the crisis was handed to Tanzania’s President Jakaya Kikwete by intelligence sources, containing the names of prominent politicians and business people regarded as untouchable due to links to the CCM. Most people on the list have not been investigated further or arrested, says the EIA. EIA Executive Director Mary Rice said, “This report shows clearly that without a zero tolerance approach, the future of Tanzania’s elephants and its tourism industry are extremely precarious. “The ivory trade must be disrupted at all levels of criminality, the entire prosecution chain needs to be systemically restructured, corruption rooted out and all stakeholders, including communities exploited by the criminal syndicates and those on the front lines of enforcement, given unequivocal support,” said Rice. Based in London and Washington DC, the Environmental Investigation Agency documents and campaigns against environmental crimes, including illegal wildlife trade. The EIA released the report today on the eve of the government of Tanzania’s Regional Summit to Stop Wildlife Crime and Advance Wildlife Conservation. This two-day conference opens Friday in the town of Arusha, the country’s safari capital, on the flanks of Mt. Meru in northern Tanzania. At the summit, Tanzania hopes to raise awareness at the highest political level about the dimensions of the poaching crisis and dynamics of illegal ivory trade in the region, and develop agreement among nations on ways to coordinate and collaborate in managing shared ecosystems. Delegates will discuss actions already underway to stop wildlife poaching and trafficking across borders in the region and share lessons learned. Tanzania already has increased the frequency of regular and special anti-poaching operations and awareness campaigns. The government also wants to motivate political, financial and technical support from the international community to stem illegal wildlife trafficking. Tanzania and other African nations hope to benefit from a new initiative by the international police agency Interpol. In October, Interpol officials announced the formation of a dedicated team in Africa to tackle illegal ivory trafficking and other environmental issues. Located within the Interpol Regional Bureau for East Africa in Nairobi, the environmental crime team will act as an extension of Interpol’s Environmental Security unit located at its General Secretariat headquarters in Lyon, France. The team will collaborate with national law enforcement agencies and Interpol National Central Bureaus in the region to increase information exchange, support intelligence analysis and assist national and regional investigations, with a particular focus on wildlife crime. With the illicit trade in ivory and rhinoceros horn a major concern in East Africa, the team will work with countries and partner organizations to further the activities of Interpol’s Project Wisdom, which combats elephant and rhinoceros poaching and the illegal trade in ivory through the financial support of the Wildcat Foundation. This includes capacity building initiatives and creating a regional network for environmental protection.